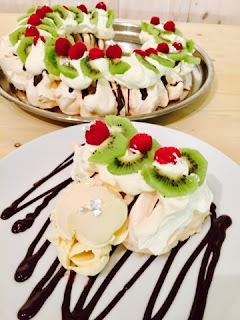 I love a good meringue. This one can be made up to 3 days in advance then decorate just before serving. You don't have to use the silver leaf, but with Sainsbury's selling it now it is very accessible. Whip the whites in a very clean bowl to soft peak stage, keeping the whisk running start adding the sugar a tbsp at a time (don't try rushing) carry on whisking until when you place a little of the meringue between your thumb and forefinger it doesn't feel gritty. Draw around a large dinner plate on a piece of parchment, turn the sheet over and place on a large flat baking sheet. Spoon blobs around the outside of circle making a big ring on the parchment. Bake in a preheated oven 90˚c for about 6 hrs or in the simmering oven overnight. Leave to cool completely before moving from the parchment. 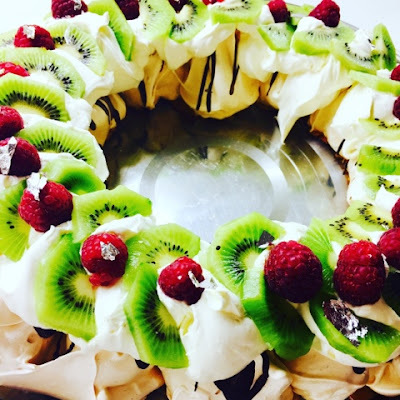 Whip the cream and vanilla bean paste to soft peaks, spoon onto the meringue, place the kiwi fruits around the top adding a raspberry into the centre of the 2 slices. Garnish with the silver leaf if using. *#TOPTIP If your meringues bleed, its because you're adding your sugar too quickly or it isn't blended enough, when the mix is ready, you shouldn't be able to feel any sugar grains in the the whipped meringue.